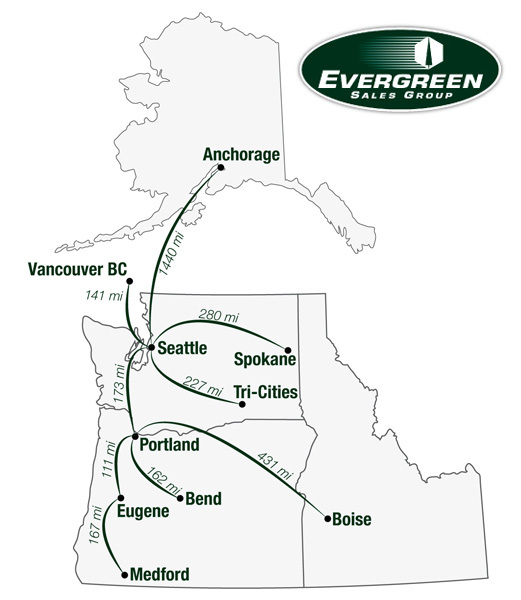 New business is what drives Evergreen Sales Group. If you have all the business you want in the Pacific Northwest, then congratulations! If you don’t, then we would love the opportunity to discuss how we may help you achieve your goals. Evergreen Sales Group was founded in 1997 on the belief that there was a need for an experienced, fun and aggressive sales-driven agency which realizes that new business is what drives our industries forward. We provide the kind of sales and service that we expected to receive as former sales managers, retailers, and wholesale distributors, but rarely experienced. We achieve this by relying on our diverse experiences, superior communication skills, utilizing the latest technologies, and by representing a limited number of manufacturers. Because we have remained committed to representing a limited number of manufacturers, we are proud to say that we have truly become a Northwest extension for each one of them. We are experts on the customer base here in the Pacific Northwest, we are natives of the Pacific Northwest, our careers have been built here in the Pacific Northwest and finally we all reside here in the Pacific Northwest. Our business values are simple: We work hard to match the strengths of our manufacturers with the needs of our customers while never trading our belief in the principles of fairness, honesty and integrity while conducting our business. 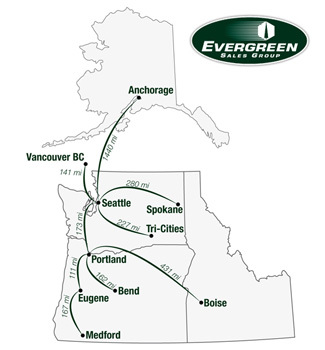 Evergreen Sales Group calls on wholesale and retail customers doing business in several categories throughout the states of Washington, Oregon, Alaska and Idaho. We have several retailers and wholesalers who do business in multiple categories and to a certain extent that shapes the products that we represent. Amazon.com, COSTCO Wholesale, Fred Meyer and BI-MART are all examples of Northwest customers that sell products into general merchandise, sporting goods, automotive, hardware, electronics and the marine categories. We are fortunate to still have a fair amount of locally based regional retailers and wholesalers, many of them reach beyond our Pacific Northwest territory for business. The Northwest customer base along with Evergreen Sales Group's knowledge and experience allow us to "cross-sell" many of the manufacturers’ products that we represent. Many products we represent fit well into a hardware store, automotive parts store, marine store or farm & fleet store. We look for products that we can present to 3 or 4 different types of customers, enabling more opportunities of exposure for our manufacturers. Our wholesalers are among the best in the country and are always looking for opportunities to grow their distribution channels. We work closely with them to feed products to retailers and end users alike. No matter the industry, today's business climate is ever changing and extremely competitive throughout all channels of distribution. We have found that our customers require much more information to help them address the issues that impact sales growth and profits when reviewing items and product categories. Depending on whom we are presenting to, "making the pitch" can be a much more sophisticated process then ever before. Because of this, we are working much closer with our manufacturers' in developing presentations and programs to match the manufacturers' strengths with our customers needs. We like to include product POG's, interchanges, current market trends, gross margin projections, return on investment projections and NPD information where applicable. Every customer here in the Pacific Northwest has a unique set of needs when evaluating products and product categories. Because of our extensive local knowledge and diverse business backgrounds based here in the Pacific Northwest we pride ourselves in knowing what those needs are. In addition to "making the sale", ESG provides service and support to our customers and manufacturers tailored to the specific needs of the opportunity. Patrick has 20 years of combined experience in the General Merchandise, Automotive Aftermarket, Hardware, Marine and Grocery categories in the Pacific Northwest and is an active working principal with account responsibilities. Patrick co-founded Evergreen Sales Group in 1997 and is now the sole principal. Prior to Evergreen Sales Group, Patrick worked for Thunderbird Lubrications (PetroCard) as a regional Manager. He started his career in the manufacturers’ representative business with the Rognlien Wright Perman agency as a district manager. While a student at Gonzaga University in Spokane Pat started working for a small oil & chemical distributor calling on mass merchandisers, auto parts stores, grocery and convenience stores. It was here that he fell in love with the competitiveness of selling and pursed a career in sales. At one time or another, Patrick has had all major account responsibility throughout the Pacific Northwest and has loved every minute of it. Mike came to Evergreen Sales Group with 14 years of service at Fred Meyer/Kroger in Portland, OR. Mike was most recently working in Fred Meyer’s Home Electronics Division where he was a buyer for imaging and wireless communication products. Mike is adept at translating his buying skills into his everyday work in sales as he has a thorough understanding of what a buyer needs to succeed in today’s competitive business environment. Mike is a detail oriented person with exceptional follow up. He also understands that quick response times and communication with our customers and manufacturers is essential. Mike is a graduate of the University of Oregon with a degree in psychology. Carl came to Evergreen Sales Group after resigning his position with PICO Wire & Terminal where he was the Western Regional manager for 9+ years. Carl is an automotive aftermarket veteran starting his career with Fram/Autolite then working in Oregon for a manufacturer’s representative’s agency prior to going to work with PICO. Carl is detail oriented and is second to none in customer loyalty. Carl has had account responsibilities throughout the years for customers in the automotive, hardware, farm & fleet, marine, heavy duty and general merchandise categories. Carl is also a proud graduate of the University of Oregon. He is a devoted family man and an Oregonian through and through. Cindy came to ESG in 2013 with a wealth of experience working as an office manager for a personal care manufacturer based in Kirkland, WA. She loves detail work and bringing positive results to any task. Working for a manufacturer who used independent sales reps in the past, has given Cindy a unique insight into both the manufacturing & representative worlds. Cindy is very familiar with how we function to support our manufactures & customers alike. Cindy works extensively with the Amazon.com account. She does in depth research and creates custom analysis and reports for our manufacturers in addition to her daily managerial functions. Steven is a Medford, OR native who spent the last 5 years managing a family run retail auto parts chain location in Medford, OR. In addition to the retail store operation, Steven was also responsible for developing wholesale business at his location. Steven is an absolute automobile enthusiast! As most natives of the Pacific Northwest, he enjoys his time outdoors camping & hiking. He values time spent with family, his church community and his friends. Steven was a team captain at his high school and an Oregon All-State Athlete in Football, Wrestling and Baseball. Ryan came to ESG from Elliott’s Tire & Service where he served as service manager. Elliott’s has 10 retail tire shops in the Seattle area. Prior to Elliott’s, Ryan was a store manager for O’Reilly Auto Parts developing both retail and wholesale business for his store. Ryan worked at O’Reilly for over 4 years while attending Northwest University. Ryan graduated from Northwest University with a degree in Business Management. He services accounts in Washington and Idaho. Ryan enjoys working on his own cars & motorcycle. Ryan is a native of the Seattle area who enjoys all sports and is an avid Seahawk & UW Husky fan. All of us can be reached at our office, via phone or e-mail, and on our mobile numbers as well. © Copyright 2018 Evergreen Sales Group. All Rights Reserved. Designed and managed by Orange Tie Designs.